I was so excited about getting to the hot wells; although, I'm not sure why because had just left Big Bend NP, which had gorgeous water. 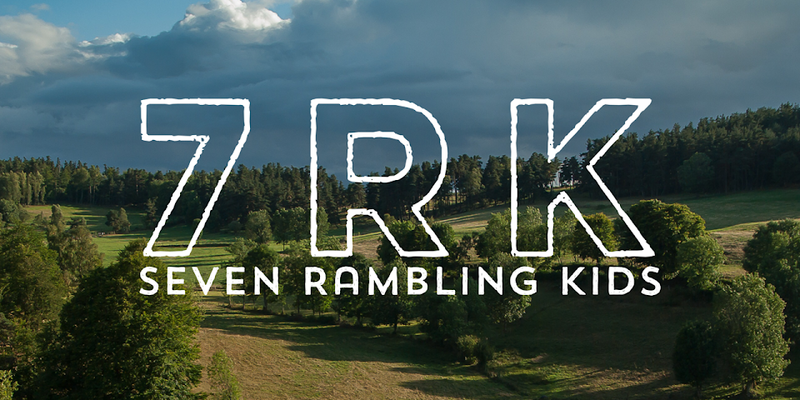 I guess it was the excitement of a new landscape and the promise of a wilderness setting. When we turned off I10 towards Bowie, there wasn't anything around. 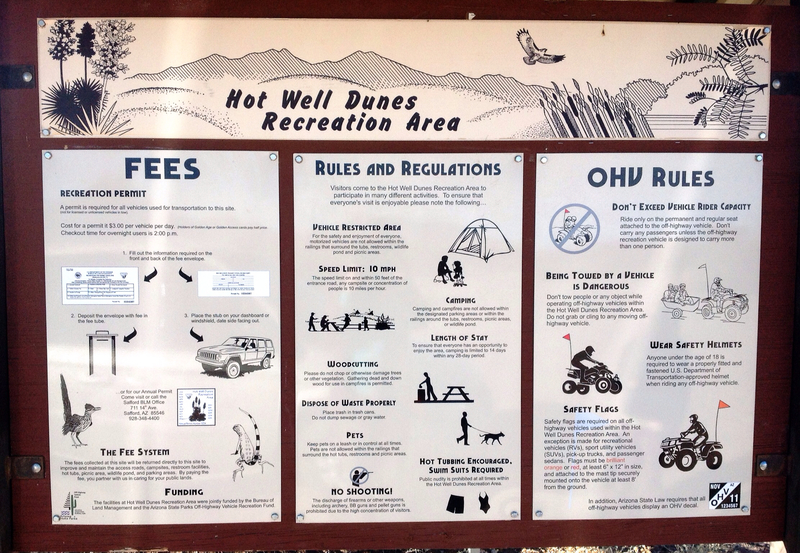 I carefully followed the directions and soon saw signs for our destination - Hot Well Dunes 19 miles. 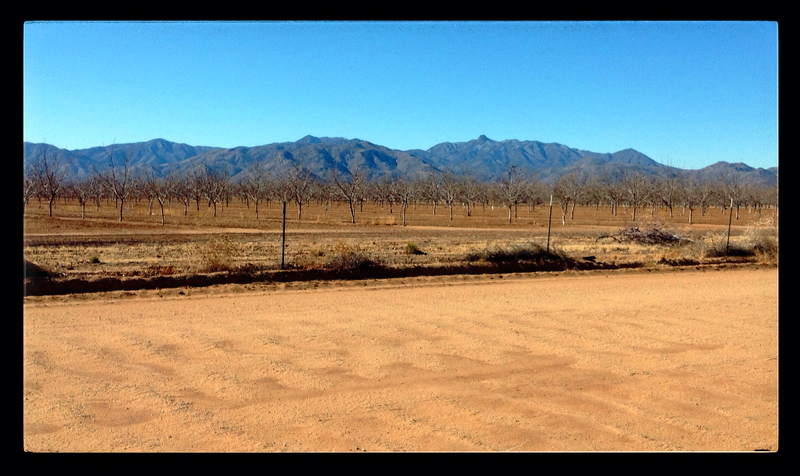 The first 3 miles were good, and there were miles and miles of pecan trees. But soon there was a sign that said, "pavement ends", and that is exactly what it meant; only it should have also said, "no maintenance proceed slowly". 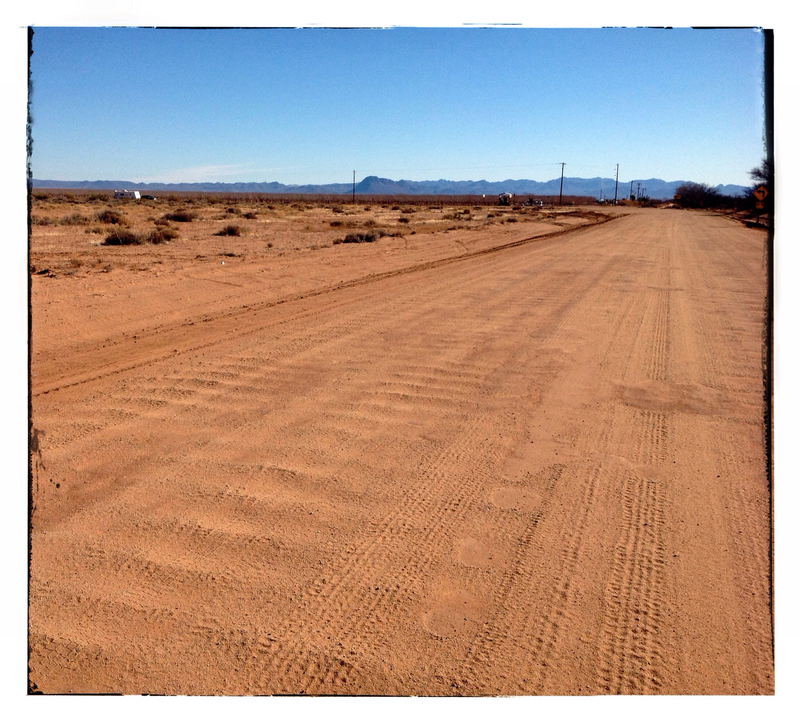 We continued on this road for 8 miles and at several points I thought about turning around. John was driving about 2 miles an hour to keep from shaking everything upside down, and the 19 mile trip turned into a 45 minute drive. Wash board road - rv in the upper left. 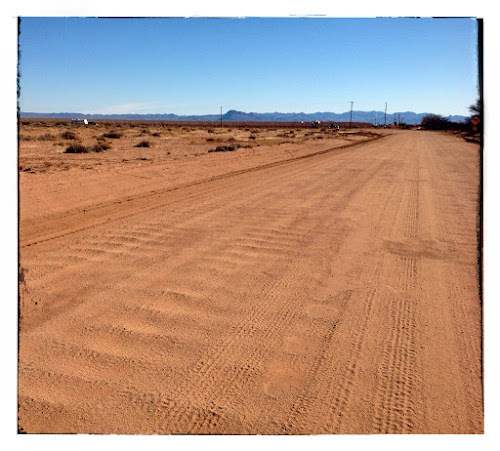 About 8 miles from the dunes, we turned onto a paved road, and could speed up a bit - 45 miles an hour. 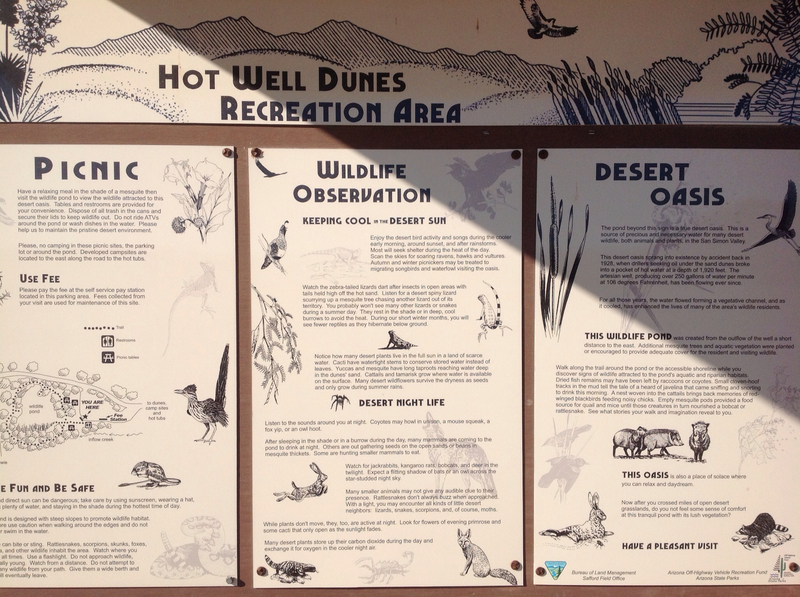 When we arrived, we were treated by the following two signs and a wonderful little walking path around a desert oasis. Fees are $3.00 a night or $1.50 with access pass. A lot of diversity in habitats here. 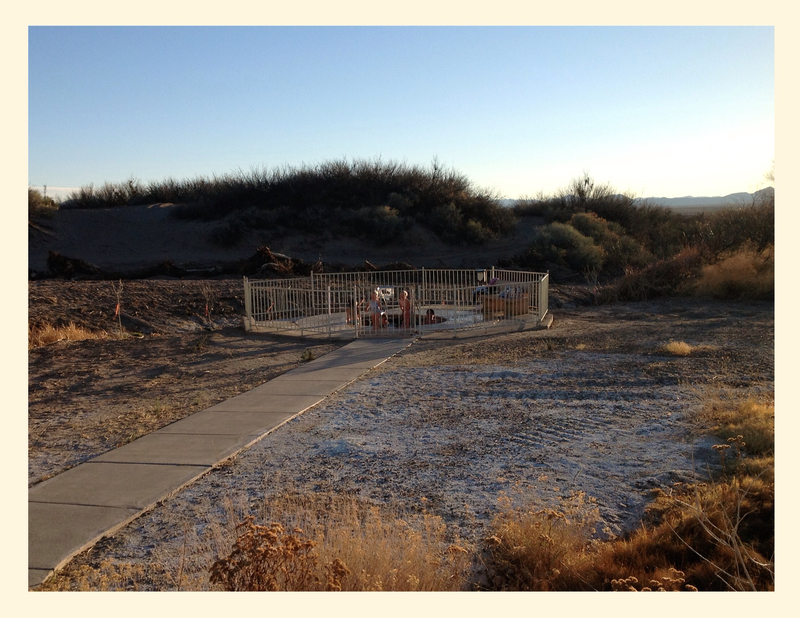 We pulled into "site" number six, and were happy to find a nice picnic table and a real fire ring with dry wood all around. Later that night John made a red hot fire that turned into beautiful smoldering embers. It is hard to tell but there are rolling dunes throughout the entire area. 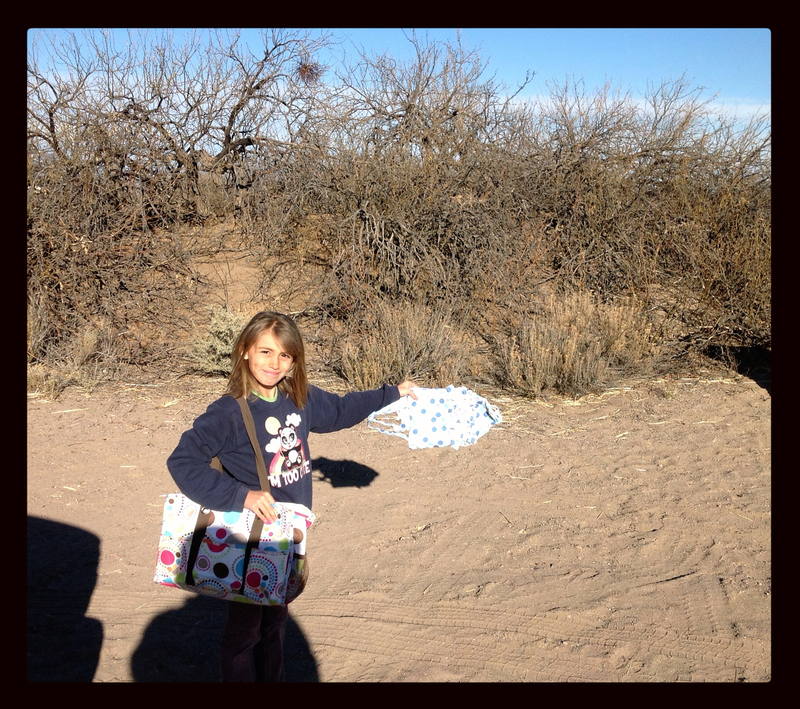 Our camp in the middle of the dunes. We hurried with our late lunch and headed for the hot wells, which I have to say were a bit of a disappointment after having spent several days at the hot springs in Big Bend. But it was warm, and the sun was setting over Mt. Graham, making it a perfect way to end a day on the road. The kids had fun in the wells, and we were the only ones there most of the time. The hot wells, there are two exactly alike, at sunset. Hanna showing off the flat swimsuits. I had only allowed for one nights stay here, and now I am wishing we would have allowed more. There was lots to explore, and we could have easily spent three or four nights, and then maybe I wouldn't have been so disappointed about the road/ride getting out there. On the back to I10, Mt. Graham was straight in front of us with it's snow covered peaks, and although there was not a single cloud over us, there was a cluster of clouds holding close to it's peak. It was a majestic view to behold. Mt. Graham as we were leaving. Snow on the peaks and clouds surrounding it. 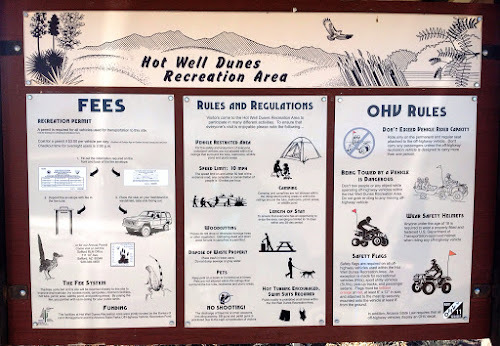 John and I both agreed we would come back to Hot Well Dunes with our next camper - a toy hauler and some toys to ride the dunes. Things were unexpectedly good from the get go. The rumours about El Paso and Ft. Bliss made us think twice about staying here but now I am glad we decided to try it for ourselves. We arrived an whole 30 minutes ahead of schedule, which rarely happens anymore - okay, so it was because we hit mountain time and gained an hour; I'll take what I can get. 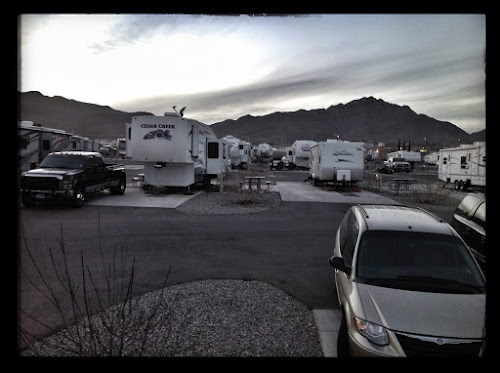 The Fort Bliss RV park is nothing but a glorified RV suburb but the facilities make up for the close quarters. 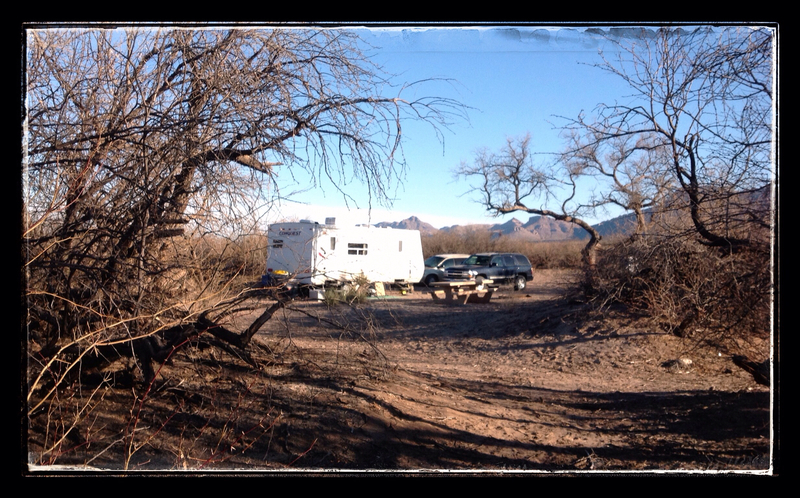 All sites are wonderfully level pull thru sites and our spot was close to the showers/laundry, which were both much needed after spending 20 days in primitive camping. The first thing we did was pile into the family shower for a nice hot shower. Then we sorted the clothes, which were piled high in the rv shower - 12 loads total. We rarely use our rv shower to wash in; it has become our laundry shoot. 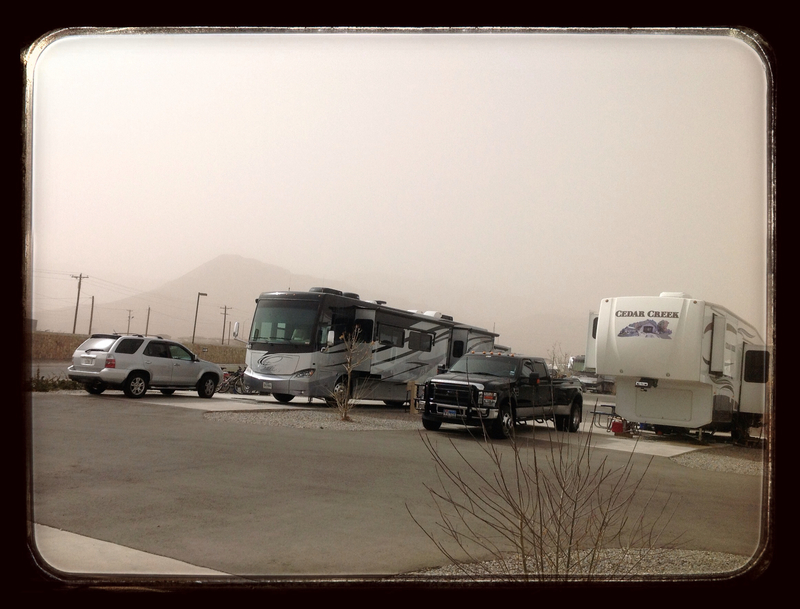 Out the same window but during the dust storm. We had originally planned on exploring the local zoo but because there was wind/dust advisory we decided not to go, which turned out to be a good thing. When we were coming back from post, the mountain range looked like there was a fog around it because of all the dust. 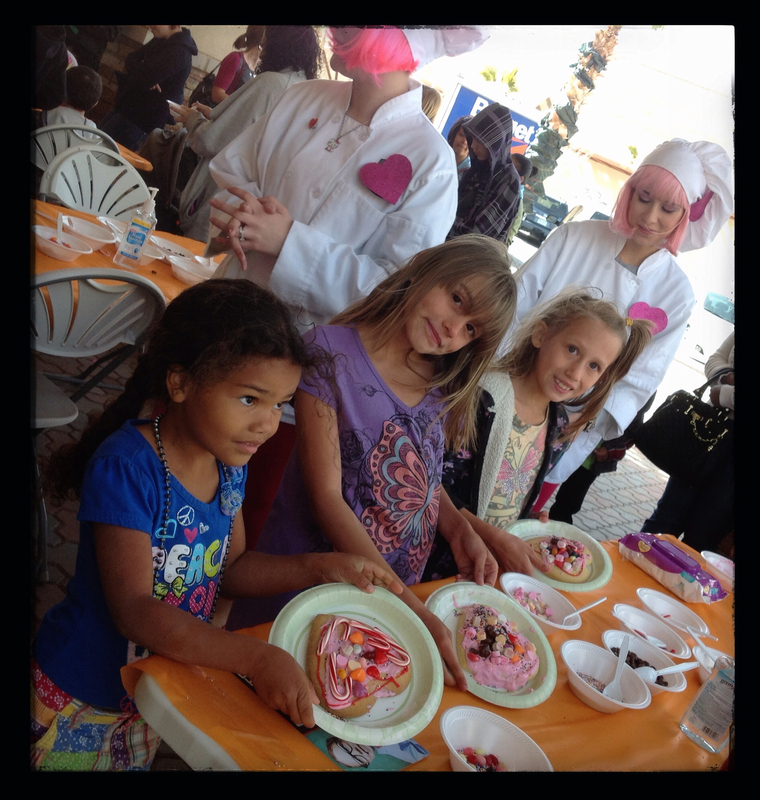 The girls at the cookie decorating station. The base is VERY kid friendly. Thanks to Margie from the laundry mat, we found an indoor play area for the kids, and there was a valentine day celebration in a beautiful courtyard called freedom crossing where the older kids made valentines cookies and other crafts, while the little ones played on those soft-sided playground things. 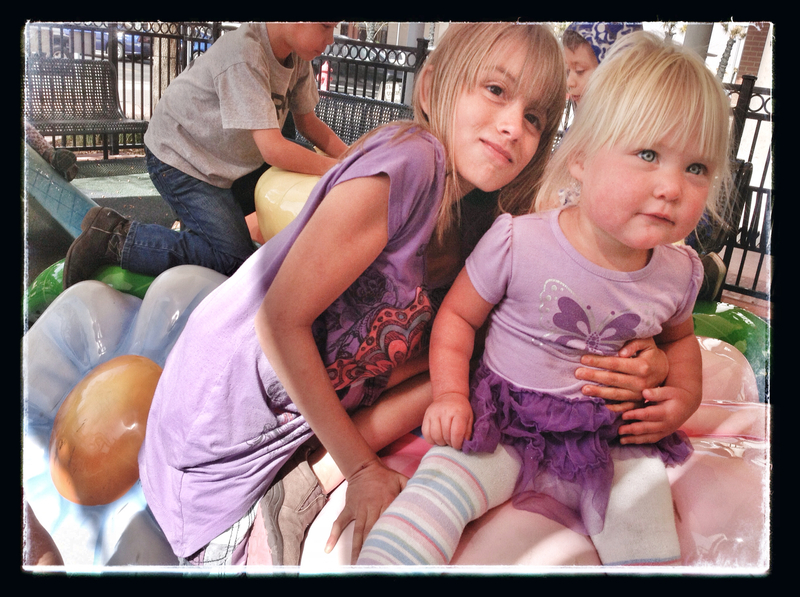 Hanna and Freya at the playground. We could easily find stuff to do here for another week but sadly with the weather clearing up tomorrow we will be heading to Hot Wells, Az.